Archery bow hunting is a great adventure. There are some very common things that keep hunters from being successful. Once you recognize that fact, you can take steps to correct these simple mistakes, your archery will improve. Many people simply misjudge distance in archery. This can be remedied simply by using a range finder and measuring distances to get an idea before you hunt. This is especially helpful when using a blind or tree stand. If you are going to be bow hunting in a fixed position, a range finder can totally eliminate misjudging distances. You can use a branch or rock to mark distance if you need to, but naturally occurring things like trees work just as well. 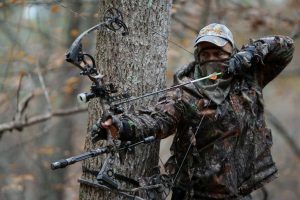 The second most common mistake in archery bow hunting is missing the kill zone. Anyone who has ever wounded then lost their prey knows how horrible that can be. In archery, there is an explicit obligation to be aware of our game’s kill zone, so that we never take the risk of leaving a wounded animal to suffer. Deer should be a straightforward broadside shot. Recognizing your shot is important too. If you take your shot while the animal is facing away from you or with its head behind a tree, you are likely to get off a good shot without spooking the animal. If equipment is in ill repair, you have wasted a hunt. Nothing is worse than realizing after you are out on the hunt that your bow is out of tune. You can only hunt with good equipment, so check and maintain your equipment often. Drawing too much weight is another big mistake. Accuracy is much more important to good hunting than speed. Setting your draw weight beyond what you can handle, is a sure way to handicap your self. Be sure to consider the added difficulty of drawing your bow in a tree stand. It is much easier standing, so if you will be sitting, take this into consideration. Often people don’t recognize the mistake of over hunting an area. Every time you go to a specific area, you are leaving your scent there. No matter what you do, you leave that calling card behind and the deer know it. By going only to the same place over and over, you practically guarantee that no deer will come anywhere close to the place. One final mistake is shooting before you should. If you get over confident and don’t wait for the perfect time, slow and easy is the catch word of the day and the best way to approach archery bow hunting.